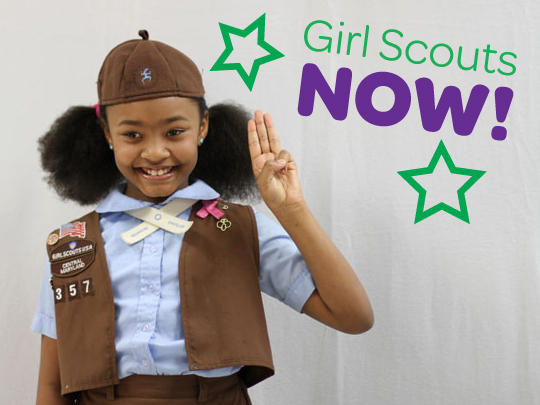 We’re excited to announce a new initiative to welcome more girls into the world of Girl Scouting–Girl Scouts NOW! Thinking about joining Girl Scouts? We invite you to join us fun, affordable events where you can participate in a few hours of Girl Scout programming and learn more about how to get involved. Already a Girl Scout? Bring a non-Girl Scout friend! We have a bunch of exciting events already lined up. Love American Girl? Come to one of our All American Girl events. Want to star in a fashion show? Walk the runway (and save the show!) at Fashion Show Rescue. How does setting off rockets, watching explosive chemical reactions and performing your own experiments sound? We’ve got that too–come to Snap Bubble Pop! Spread the word and come see just how cool Girl Scouting can be! Visit our events calendar for more information. Register for all Girl Scouts NOW! events here.